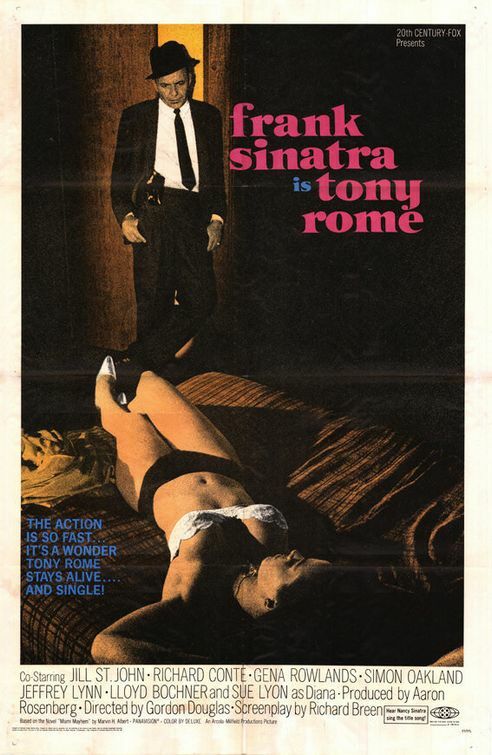 Tag line: "The action is so fast... it's a wonder Tony Rome stays alive... and single!" I’m a fan of Frank Sinatra’s music (my favorite being “Summer Wind”, probably because it figured so prominently in The Pope of Greenwich Village), but it’s his movies I really enjoy. In fact, taking into account his superb performances in The Man with the Golden Arm, The Manchurian Candidate and From Here to Eternity, I’d say he was almost as good an actor as he was a singer (I said “almost”). While I wouldn’t rank his turn as the title character in 1967’s Tony Rome among his best (it wouldn’t even make the top five), the movie itself is a slick crime / mystery that keeps you guessing ‘til the very end. Private investigator (and compulsive gambler) Tony Rome (Sinatra) is hired by his old partner Turpin (Robert J. Wilke) to give a drunken young heiress named Diana Pines (Sue Lyon) a ride home (she was barely conscious when she checked into the hotel where Turpin now works, and both he and the manager are anxious to avoid any scandal). Tony agrees, but soon after dropping her off, the young lady’s father, real estate tycoon Rudy Kosterman (Simon Oakland) hires Tony to find out what’s bothering his daughter. Tony isn’t on the job for more than a few hours, however, when he’s visited by a couple of thugs, demanding that he return Diane’s diamond pin (which, apparently, went missing while she was drunk). Tony says he doesn’t have it, but the two guys knock him out and ransack his place anyway. Things get even more interesting when Diane herself shows up at Tony’s houseboat the next morning, asking for her pin; and later that day Kosterman’s second wife (and Diane’s step-mother) Rita (Gena Rowlands) also inquires about her step-daughter’s missing jewelry. Tony’s suspicions that there’s more to this case than a diamond pin are confirmed when he swings by his office and finds Turpin’s dead body lying on the floor! Now a murder suspect, Tony has to keep his old pal police Lt. Dave Santini (Richard Conte) off his back as he tries to figure out who killed Turpin, and how (if at all) his death is linked to the Kosterman’s jewelry woes. Accompanied by pretty divorcee Ann Archer (Jill St. John), Tony visits some of Miami’s seediest clubs looking for clues. But no matter how many rocks he turns over, he can’t seem to find that one worm he’s looking for. As I mentioned above, Sinatra’s performance in Tony Rome isn’t one of his strongest; the fire he displayed in earlier films like From Here to Eternity and The Manchurian Candidate is missing here. Still, he has an undeniable charisma, and his street-smart attitude convinces us his character is the perfect guy to tackle such a complex case. The supporting cast fares a bit better than its star, especially Jill St. John (as the voluptuous love interest Ann Archer) and Simon Oakland (whose Rudy Kosterman is as naïve as he is powerful). Also good in a brief role is Jeanne Cooper as the alcoholic Lorna, Diane’s real mother; while the always-reliable Richard Conte gives the films lead the one ally he can fully trust. But what really impressed me was how the movie’s plot twisted and turned in so many directions, pitting Tony against some very unusual characters (including a stripper and her live-in girlfriend) as he attempts to solve a case that gets more perplexing with each passing scene. And thanks to its smart script (written by Richard L. Breen, based on the novel Miami Mayhem by Marvin H. Albert), never once did I find Tony Rome confusing or hard to follow. So, while it may not be Frank Sinatra’s best film, Tony Rome definitely ranks up there with Bullitt, Harper, Blow-Up, and In the Heat of the Night as one of the late ‘60s most intriguing crime mysteries.